Comments: Gray wadalite masses in matrix. Location: Tadano, Koriyama, Fukushima, Japan. Scale: See Photo. 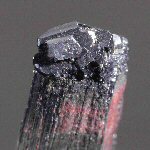 Comments: Sharp hexagonal crystal of wadeite with included dark green aegirine. Location: Mt. Kukisvumchurr, Khibiny Massif (Russia). Scale: 12x10x6 mm. Comments: Octahedra of wairauite in serpentinite. AmMin v33:942. Location: Red Hills serpentinites of the Wairau Valley, South Island, New Zealand. Scale: See Image. Comments: Golden colored, acicular crystals of wakabayashilite on matrix. Location: White Cap mine, Nye County, Nevada, USA. Scale: Picture size 3 cm. Comments: Bluish black crystal of wakefieldite-(Ce) on matrix. Location: Yellow Lake, Olala, British Columbia, Canada. Scale: Not Given. Comments: Thin section image of wakefieldite-(Nd) in orange caryopilite with hematite and rhodochrosite. Location: Ferruginous manganese ore from the Arise deposit, Kochi Prefecture, Japan. Scale: See Image. Comments: Black rectangular prisms of wakefieldite-(Y) on matrix. Location: Yellow Lake, British Columbia, Canada. Scale: See Image. Comments: Greenish yellow, flattened, radial, crystalline aggregates of walentaite on quartz. Location: White Elephant mine, Custer County, South Dakota, USA. Scale: Picture size 1.5 cm. Comments: Crystal of orange walfordite on a matrix of alunite, (CanMin, v37:1261). Location: Wendy open pit, Tambo mine, El Indio - Tambo mining property, Coquimbo Province, Chile. Scale: Crystal Size 0.2 mm. Comments: Clear, yellow laths of walpurgite crystals. Location: Schneesberg, Saxony, Germany. Scale: Not Given.